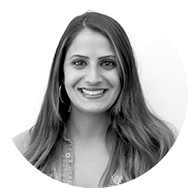 I'm Jess, Director of Employee Experience, and I designed DigitalOcean's office. Before the contractors could start construction, and before our architect RA-DA could draw up blueprints, we needed architectural requirements. 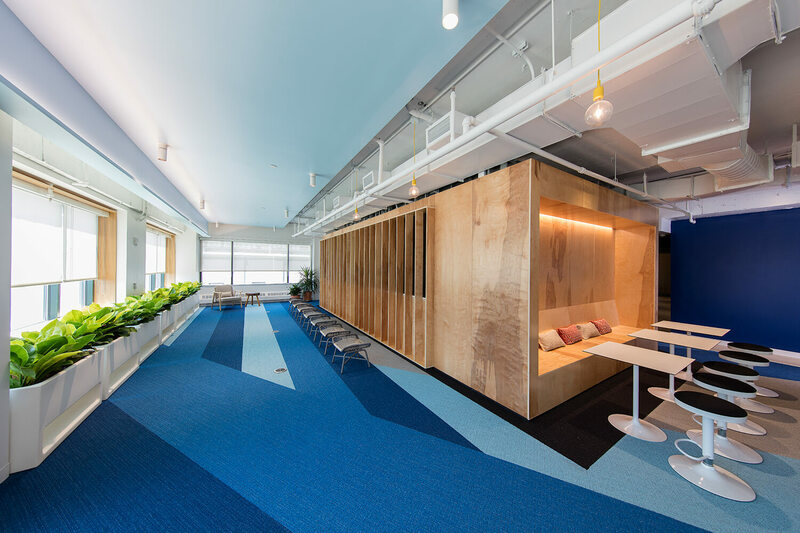 My hope was to design a space where we could do our best work. When employees are comfortable at the office, they're free to concentrate on moving the business forward. In this post, I'll give you a behind-the-scenes look at how I turned those two priorities into a design for DigitalOcean's office. I approached the first stage of research with this philosophy: accommodate everyone. 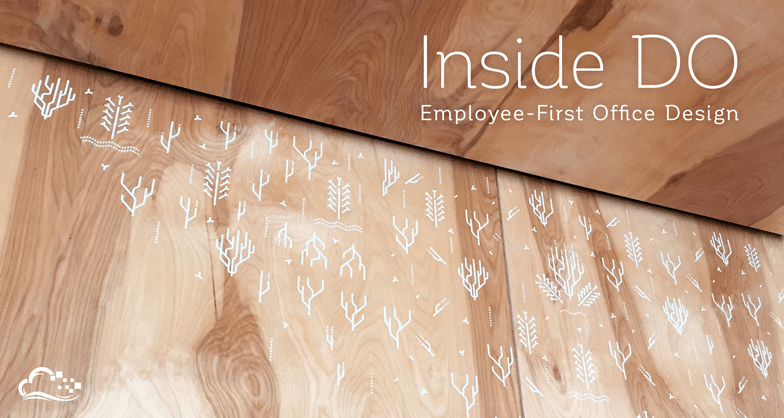 Listening to our employees puts them first. This meant working with our introverts and our extroverts, our chatty types and our quiet-lovers, and most of all, the employees who cared about their workspace. Not everyone has strong feelings about offices. With that in mind, I invited employees to opt in to a group discussion about our architect's initial survey. By making this optional but open to everyone, employees who were highly invested in the new office design could identify themselves. At our first meeting, we showed these self-selected contributors dozens of concept pictures. We asked questions like how many private offices we needed, and whether we wanted bike storage and showers. Brainstorming over these concrete details, without trying to decide immediately, got everyone thinking creatively. I ended the meeting without making any decisions, so everyone would have time to mull over our options and collect ideas on a group Pinterest board. That shared board is how we found our lunchroom picnic tables, chalkboard wall, and a couch everyone liked. Then, we had a follow-up meeting where our employee stakeholders identified three key features we wanted for the new office. 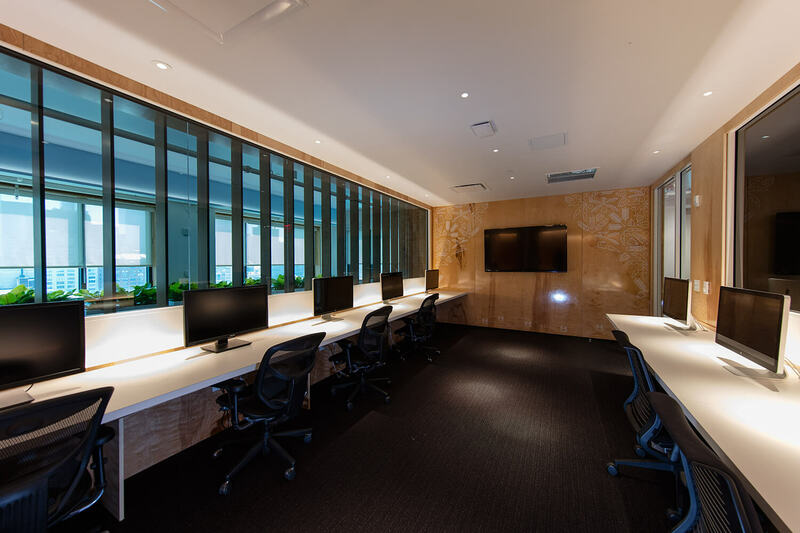 This last requirement became a guiding light for the general office layout: our desks would line the perimeter so we get to enjoy the windows all day, instead of blocking them with conference rooms and private offices. Meeting rooms would go in the middle. With these principles, the number and use case for each room fell into place. I gave my architect RA-DA our list of requirements so she could make three designs to choose from. Going through this process with my coworkers also taught me so much about our personalities and how physical spaces affect our work. Next, I researched how to make our office feel unique to our company culture. I went on a fact-finding survey to San Francisco, hotbed of tech startups. I toured 11 offices in 2 days. Twilio was my favorite stop because the heart of the company showed through. They framed a pizza box holding the founders' first notes for the company plan. They celebrated the present just as much as the past with movie posters for each feature release, signed by all employees. DigitalOcean doesn't have a pizza box or movie posters, but I knew I wanted to make our culture shine in our space. I decided on two themes to start with, one serious and one fun. For simplicity, I chose light finishes and clean lines. I wanted a carpet reminiscent of the ocean, but instead of a complicated print, I went with wide stripes of ocean blues. Our mascot Sammy the Shark is just the first part of our ocean theme. I asked our illustrators to create themed decals for each conference room, like Treasure Chest, Iceberg, and Jazz Walrus. Then it was back to SoHo, where we picked the final office layout and moved on to finishes and furnishings. Let's talk about noise. A little under half of our workers (40%) were seeking a silent office. 60%, on the other hand, wanted to chat without getting shushed, or just preferred to work with a bit of bustle in the background. For the quiet-lovers I installed noise-dampening panels between desks and added sound-soaking fluffy rugs to conference rooms. These accommodations make the main floor friendlier for chatting, since the noise doesn't travel. I also created the lockdown room, called The Cove, with darkened windows as a no-talking, no-eating zone, and big enough that employees can come in any time and find a seat. Instead of shushing coworkers, they can head to The Cove for some quality heads-down time to code, put together financial reports, or write a technical article. DO employees like to wander away from their desks. This helps us find a new place to focus, or encounter someone to collaborate with. 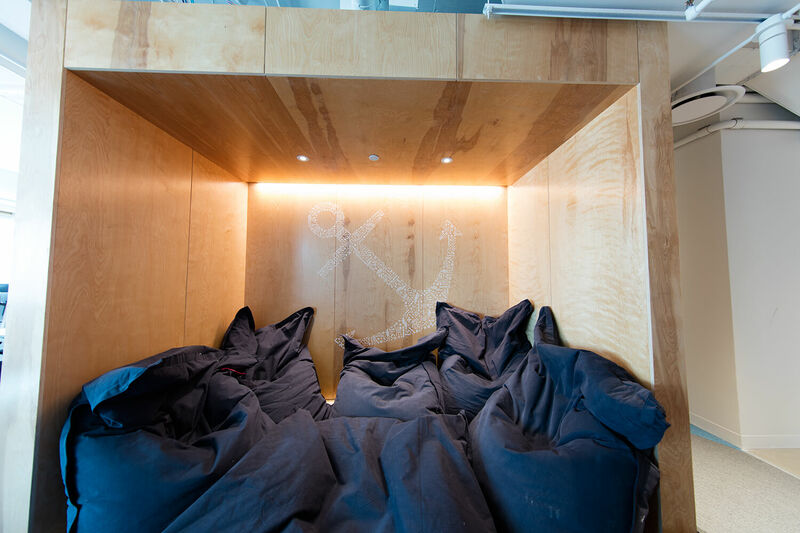 The beanbags are a prime place to get some solo breakout time with your feet up. After hours, folks like to hang out on the sectional couches in the middle of the office, a central social area that helps different teams find each other. On the other hand, sometimes we need privacy; spaces where employees can be heard without feeling overheard. In an open office, that's not a given. So, I built lots of smaller 2- or 5-person meeting rooms. 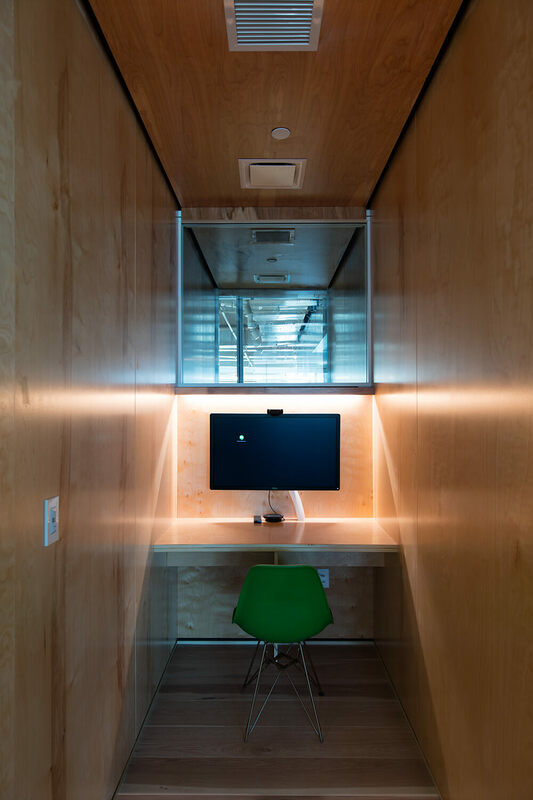 Wood inner walls and glass outer walls let employees see out while having a solid wall at their backs, so they don't feel like someone is behind them even in the central area of a big office. The meeting rooms each have a unique feel separate from the main office floor, boxing the world out for a truly private chat. Our support team works around the clock, and many employees prefer nonstandard hours. Regardless of start time, the place where people spend eight hours every day should promote mental and physical health. To accommodate our all-hours workforce, we stock the office with beverages, snacks, and breakfast foods so employees never have to work hungry. Office plants make people happier and improve air quality, in addition to being another top employee request. For the workstations themselves, we opted for adjustable sit-stand desks, and we let employees test and vote on their preferred chairs and monitors. Choosing physically flexible workstations lets us accommodate employees of all body types and builds. We also opted to use a mobile app to manage access to our floors. You might forget to bring a key fob to your late-night coding session, but you'll probably have your cell phone handy. Paying attention to the psychology and ergonomics of our space helps us take breaks from the stress of startup life. With 45% of our employees working remotely (give or take as we keep hiring), our physical space needed to aid, not detract, in bringing our remote and HQ workers together. Videoconferencing is the most important interface between our physical office and our far-flung employees. Every meeting room comes with a TV and a Chromebox with the appropriate software already installed, so it takes just a few clicks to join a remote meeting. We have cameras and screens installed in social areas of the office as well, like our Support department, lunchroom, and presentation space, where remote employees can see and be seen. This also informed my decision to create two single-person phone booths, where an HQ employee can meet with remote coworkers or other business partners privately. Sometimes employees take their laptops into the booths instead of using the TVs, but just having those dedicated spaces for HQ-remote communication makes a big difference. If you're ever tasked with designing an office, your architect will become your most trusted advisor. Many office architects are experienced in designing for older companies, so make sure you work with a professional who thinks outside the box, and gets the startup mentality. Have you actually asked them? It's essential to brainstorm with your most important stakeholders. What type of people will be at the office all day? Will you have visitors? How do different teams work together? What does your space need to accomplish? How you can physically express your company's personality and values in the office? In the end, who approves the blueprints? After you've learned more about construction than you ever expected, and that day finally comes when you move into the new office, you'll get to see your coworkers living, meeting, and making awesome things in the space you designed. That, and a well-earned vacation, makes it all worth it.